Educator, Geoffrey Langlands: Portraits: New Orleans based Photojournalist covering the Deep South and beyond. LAHORE, PAKISTAN. 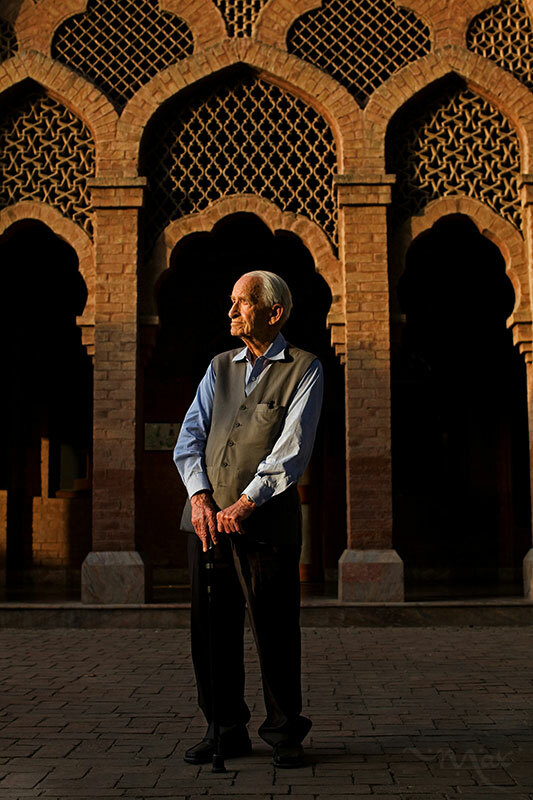 Geoffrey Langlands stands for a photo on the grounds of Aitchison College, a boarding school for boys in Lahore, Pakistan on Wednesday June 6, 2012. Langlands waded onto the shores of British India on a troop carrier in 1944 and now at age 94, finds himself near the end of a long career as an educator of some of Pakistan’s best-known leaders. For the last 20 years Langlands has dedicated his teaching talents to establishing the Langlands School and College in Chitral, located at the base of the Hindu Kush mountains in Pakistan’s Northwest Frontier province. In October of this year Langlands retired to a two-room apartment on the grounds of Aitchison College where he spent the middle 25 years of his career as a housemaster and headmaster. Langlands was housemaster of Kelly House, seen in the background, which is an Anglo-Mughal style boarding house on the Aitchison College grounds.